What an appropriate way to start out the week. I've declared myself Queen of Hearts. I'm really having fun with the projects at SAS Project Tuesday . I don't usually do much except cards, but these girls really have me creating outside my box. My friend Linda http://multicoloured-imagery.blogspot.com provided me with the badge holder, it's nice to have friends who share. At first I said who will I make a bag tag for, but then it came to me--ME! 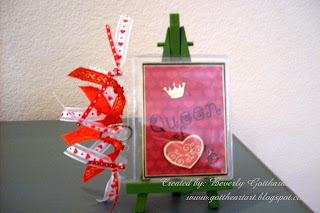 I should have made this for Linda, but since I had already declared myself Queen, I couldn't pass, Queen's are like that. Supplies: Paper from-K&Co. 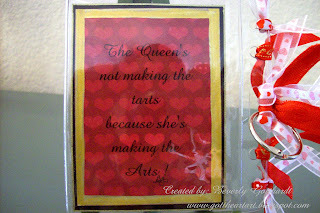 Brenda Walton Sweet Talk paper pack,black card stock, gold crown brad, Ink: Ranger Archival Ink-Jet Black, Stampin Up-Ruby Red, Sharpie Poster Paint Pen-gold, computer generated saying on back using Printmaster 11, Stamps: Inkadinkado-97637 Hearts, My Sentiments Exactly-Y526 Multi Retro, SSC007 Storybook Alphabet, CTMH-C1002 Pizzaz Lowercase, D1020 Pizzaz Caps, ribbons-Hobby Lobby, pop dots. 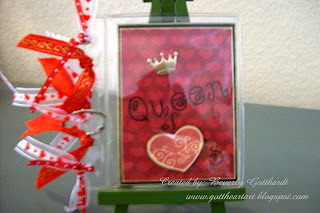 Your project turned out so lovely, deserving for a queen! I love your last name!!! Thanks for playing along with us at Stamps and Smiles project tuesday!